Hello and Happy Monday. Hey, I'm trying to be positive here. It's the Monday after the Spring time change so that's a double whammy but sewing makes everything better. 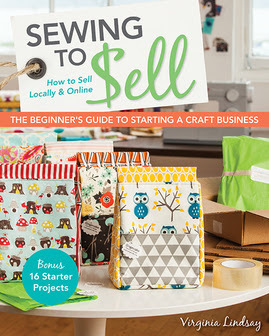 I bought the book "Sewing to Sell A Beginner's Guide to Starting a Craft Business" by Virginia Lindsay about a year ago and I have been using it A LOT these past couple of months. I am not a beginner at having a craft business but I am new to craft shows having only done one so far. There is a lot of great information in here. There are also 16 projects that you can make and are allowed to sell. I made six Kids' Craft Aprons - a slight modification of the Craft Apron pattern in the book. They are modeled here by my daughter. Craft aprons from the book Sewing to Sell A Beginner's Guide to Starting a Craft Business.